If you’re a motorhead at heart… Make sure you follow us on Facebook for the most up to date, awesome car-related content. If you are a car fanatic, you have just hit the jackpot by choosing to check out our page! Let us know in the comments below if you would like to see a specific feature, and don’t forget to share your pictures and stories with us. Click here to follow us now! Don’t just take my word for it, type @GiorgioExpress_ in your Facebook search and have a look for yourself. 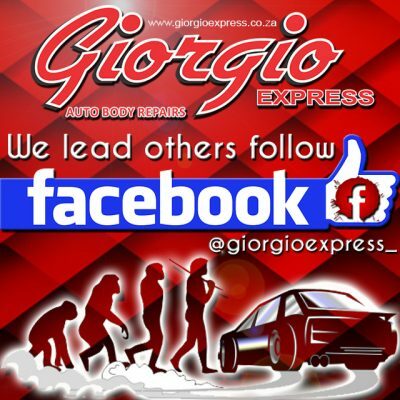 Giorgio Express Auto Body Repairs is one of the most sophisticated panel shops in KwaZulu Natal. Our staff are highly qualified and experienced. Together with our state-of-the-art equipment, we are able to ensure that you and your vehicle are in good hands. We specialise in complex and intricate repairs, spray painting and polishing of a highest quality.